Once again we arrive at a Thursday night. That obviously means that it is time to list off ten more of the most fantastic Nintendo DS retail games the system has ever known. This list describes the best and the brightest of the library. Perhaps some of my picks will attract you to tracking down a game or two yourself that you never would have tried out. Regardless, remember that the games on this list must have launched in North America to be included. With that out of the way, let's get to the next ten titles! 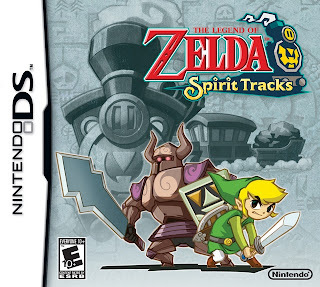 The final of the two mainline Zelda games to reach the Nintendo DS, The Legend of Zelda: Spirit Tracks brought with it the same novel touch control gameplay of Phantom Hourglass with less of the headaches. No longer did players have to traverse an overly familiar Temple of the Ocean King after each dungeon, getting deeper and deeper inside each visit. Instead, players visited a tower after each dungeon, with no need to revisit past areas inside. The sea that players explored in Phantom Hourglass was replaced by a more modern means of transportation, a train. One of my favorite parts of Spirit Tracks was the new role Princess Zelda adapted to, a helper role. No longer was she captured by Ganon, sealed up - no, she could possess Phantoms to help Link solve puzzles. The relationship between the two characters was really genuine, natural, and felt fresh, something great for the series. If you have an open mind to different control schemes (i.e. you aren't an annoying type of gamer who is stuck in his or her comfort zone, won't try anything new, etc. 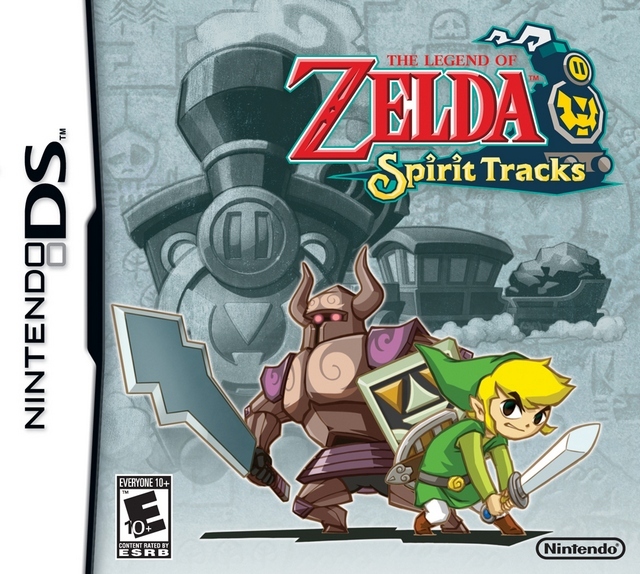 ), then The Legend of Zelda: Spirit Tracks is a spirited pick. 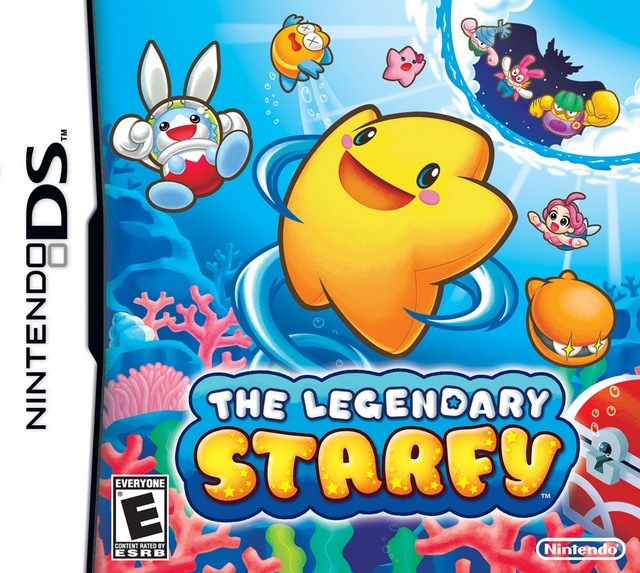 After years of games being exclusive to Japan, Nintendo's Starfy character finally swam across the Pacific and into the West with The Legendary Starfy. It is actually the fifth game in the series, but the first for the West. Regardless, the game reminds people a lot of Kirby in its level design, ease of difficulty, and aesthetics. 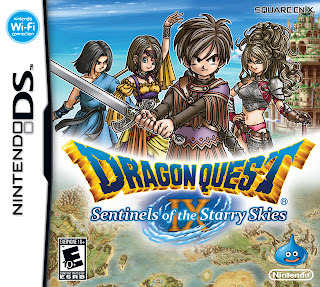 This DS release had 2D sprites and foreground objects while the backgrounds were full 3D renders. It was an interesting and diversified art style, for sure. Starfy could access one of many costumes to turn into a ghost, a seal, a dragon, and even a chicken. Yes, a chicken. How cool is that?! Another cool feature of the game was the ability to play cooperatively with a friend between two DS systems and only one copy of the game between each. Usually players needed two copies of the game for such a mode. Nonetheless, co-op could only be performed during certain areas and boss battles, and not the full game. 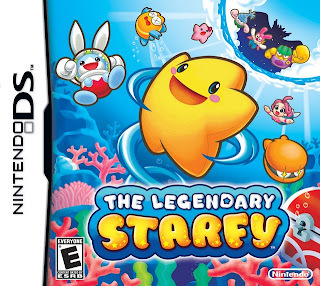 I really hope that the rest of the Starfy series somehow makes its way to the West. I wish upon a star for such a miracle. One of the more overlooked and under-appreciated Game Boy Advance titles was DK: King of Swing. It didn't possess the same 3D rendering art style of the Donkey Kong Country series, replacing it with a more Saturday morning cartoon feel. 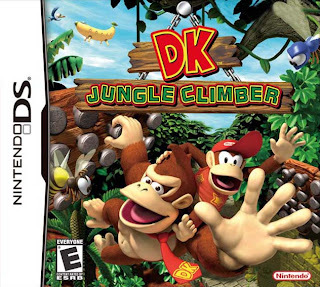 In DK: Jungle Climber, the star of the show is, of course, Donkey Kong, but rather than going it alone like in King of Swing, he is partnered up with Diddy Kong. Just like King of Swing, DK: Jungle Climber has you holding down L and R to lea into the air, and cycling between the shoulder button to grab onto pegs, which make up the majority of levels. You're essentially using the L button to clinch the character's left hand, and the R button to clinch the character's right. Grabbing onto one peg at once allows DK or Diddy to spin, allowing them to move through each level. The game is a very atypical platformer, but it contains all of the features of the popular Donkey Kong Country series, such as bananas, bonus areas, bosses, Kremlings, and more. The game is constantly throwing new surprises into the gameplay. For instance, one level has DK being mirrored on the top and bottom screen. The player must watch both screens and navigate both Kongs through the area without hitting an object on either screen, or else the section must be redone. It's these clever ideas and gameplay elements that make for an exciting and challenging game. 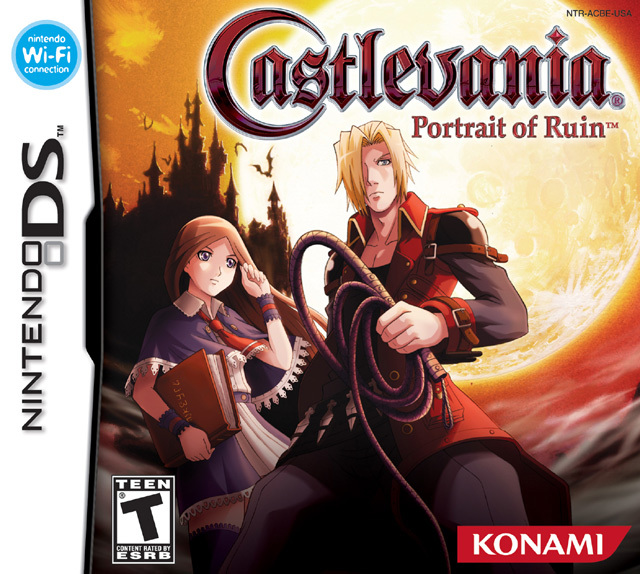 Castlevania: Portrait of Ruin was a series of firsts for the franchise. If I recall correctly, it was the first Castlevania with some form of cooperative multiplayer component, and it was the first handheld Castlevania with English voice work. Portrait of Ruin consists of a setup similar to Dawn of Sorrow's Julius Mode. Players switch between two heroes on their quest to vanquish the vampire king once more. Many puzzles require changing between the two to solve them. The "portrait" in Portrait of Ruin refers to the paintings that both heroes can leap into a la Super Mario 64 to enter new worlds outside of the confines of Dracula's castle - regardless of how expansive it very well is. Like every other Metroid-style Castlevania title, Portrait of Ruin has players earning new abilities to reach previously inaccessible areas. There's a bevy of bonus modes such as Sisters Mode, Richter Mode, Old Axe Armor Mode, and a Boss Rush to relive all of the intense encounters of the game. Despite all of these features and quirks, Portrait of Ruin is probably my least favorite of the Castlevania trilogy on the Nintendo DS. It's still a sensationally worthwhile game to pick up, so don't get me wrong in the slightest. 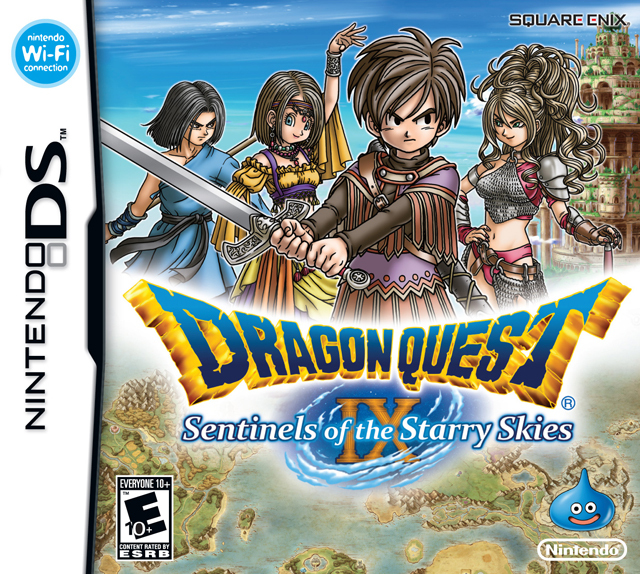 The first mainline Dragon Quest to arrive on a Nintendo platform in over a decade, and the first mainline Dragon Quest to launch on a handheld, Dragon Quest IX: Sentinels of the Starry Skies did a lot to evolve the franchise from its old school roots. For example, it brought with it the elimination of random encounters, a nuisance that was a terrific example of archaic game design in classic RPGs. It also brought forth local multiplayer and even some online functionality. A vast shift in philosophy regarding playable characters was also a part of the package with Dragon Quest IX. Players did not get issued a standard hero with no ability to customize his appearance. Instead, players could map out their hero's gender, race, hair style, and all the way down to their eye shape. But don't think that the ninth installment of this epic role-playing series changed for the worst or was indecipherable from the rest of the series. No, turn-based battles were still present and an important part of the game. In fact, Dragon Quest IX was noticeably more challenging than past Dragon Quest games, too, despite being on a Nintendo system. Generally developers get the idea that Nintendo owners want dumb downed experiences. Thankfully, Level-5 did not go this route, and they created a brilliant RPG for it, with tons (and I do mean tons) of quest to partake in. Dragon Quest IX was one meaty experience worthy of any RPG fan's time. 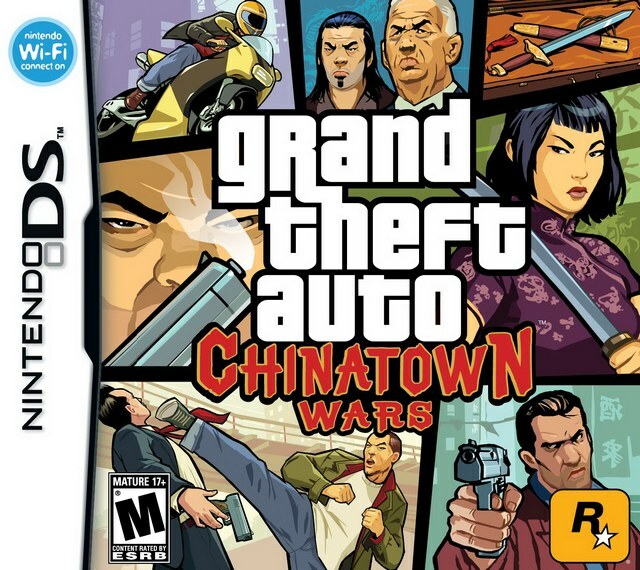 Many people were disappointed with how Grand Theft Auto: Chinatown Wars wasn't in line with typical GTA games (i.e. fully 3D). The game was an overhead viewpoint with a camera that could be revolved around 360 degrees. However, to those who actually played the game, they found a delightful, coarse in content, and full of thrills GTA experience on the Nintendo DS. And finally no longer did I have to run out of a warning zone to lower my police notoriety; I could demolish as many police cars as possible instead. The more my wanted level was, the more cop cars I needed to destroy. No doubt at all that fans of current day GTA have no desire to return to the top-down perspective that Chinatown Wars holds onto. This old school approach to the design not only affected sales of the Nintendo DS version, but it hurt sales when the PSP port was released, too. 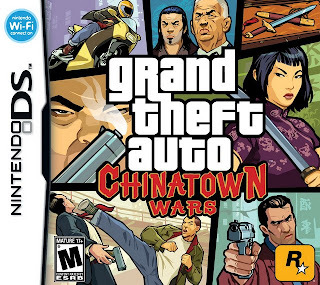 It is a shame because Grand Theft Auto: Chinatown Wars is one of the DS's most expansive, ambitious, and wonderful games (from a Western third-party no less) on the Nintendo DS. What do you get when you partner up the man behind Rez and Lumines, and the creator of Kirby and Super Smash Bros.? Why, you get Meteos, a daring puzzler for the Nintendo DS that arrived within the system's first year on the market. Generally a player will be fixated on the bottom screen where blocks tumble from the top screen to the player's viewpoint and form stacks of blocks. Sounds similar to many puzzle games like Tetris and Lumines, right? Well, the trick here is that the player is able to cycle blocks up and down in the stack with the desire to line up a minimum of three blocks in a row, vertically or horizontally. Once this feat has been achieved, the matching blocks will launch like a rocket and propel themselves into space (in battle mode, they will appear on the player's opponent's side). There are even more ways to manage to ignite even more blocks to create one large propulsion of blocks to clear most of the player's screen. The goal is to send as many blocks as possible into orbit. One of the only downsides to Meteos is that simple scribbling could make the game easier for players without much skill. The sequel to the game, Meteos: Disney Magic, would make efforts to eliminate such tactics. 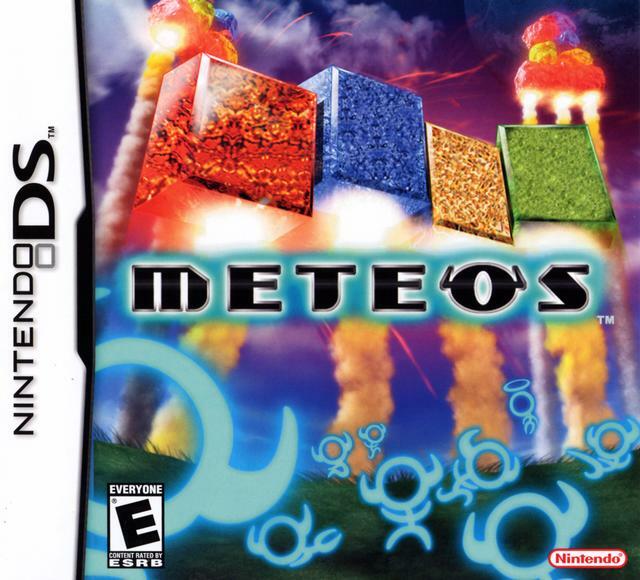 Nonetheless, the original game is still what I perceive to be the definitive version of Meteos. 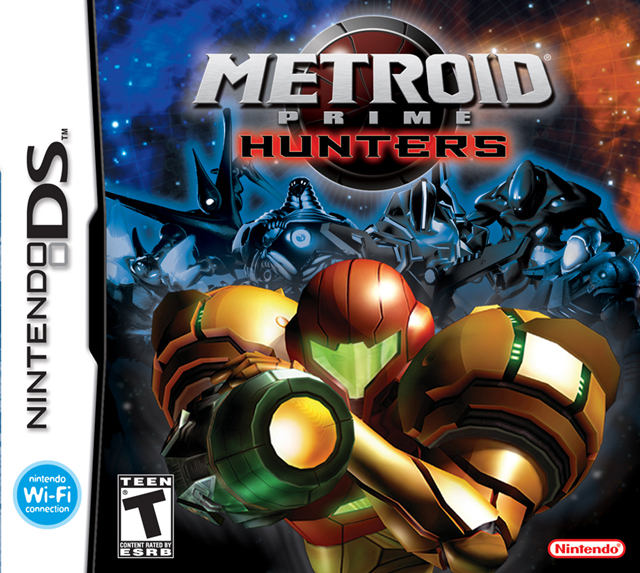 If you recall back when the Nintendo DS first launched way back in 2004, it came with a rough demo of Metroid Prime Hunters called First Hunt. The full game would be released one-and-a-half years later by NST, a team within Nintendo. Metroid Prime Hunters was quite unlike any other Metroid before it. Its focus was not only just on the single-player experience, but it possessed a fully functionality and extensive multiplayer component. The campaign wasn't that revolutionary. Find keys, battle bosses, escape before the area explodes, rinse and repeat. It could be viewed as repetitive, really. But where the game truly shines is with its multiplayer. Taking 20 or so locales from the story mode, adding a host of weapons, and the bounty hunters shown in the game, and turning Metroid into a frag-fest made for an interesting and entertaining dynamic. Some might complain that the series was shoehorned into a genre that it doesn't fit, but many Nintendo fanatics proclaim that Metroid could be Nintendo's Halo. Regardless of whether or not this is an insane thing to say (well, a lot of Nintendo fanatics come off as insane and scare me deeply anyway), Metroid Prime Hunters and its innovative control scheme made for nights of intense fragging between friends and total strangers, online and off. A remake of the very first Fire Emblem game (not that many Westerners played the original), Fire Emblem: Shadow Dragon was the first Nintendo DS entry for the series, as the developers wanted to show off the system's touch screen and online capabilities. The latter made for the first Fire Emblem game with online functionality, allowing two players to hop online and battle it out. Shadow Dragon was comprised of twenty-five individual chapters of war and destruction. There are six difficulties to choose from, so everyone from beginners to Fire Emblem veterans could jump in and enjoy the game. Battles are turn-based tactical affairs where over twenty specialized units are available for combat. 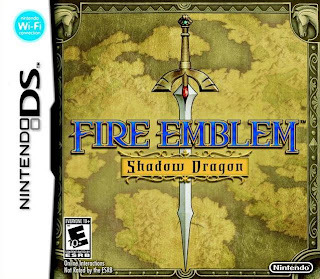 Fire Emblem: Shadow Dragon is yet another capable entry in the well regarded franchise, and it helps illustrate just how far the series has come. From its earliest days on the Famicom to its latest and one of the most popular installments yet in Fire Emblem: Awakening, the fire burns bright for Nintendo's tactical franchise. The final game of Part Four of tonight's article is another kind of tactical RPG, but this time it comes from the universe of Final Fantasy Tactics and the world of Ivalice. 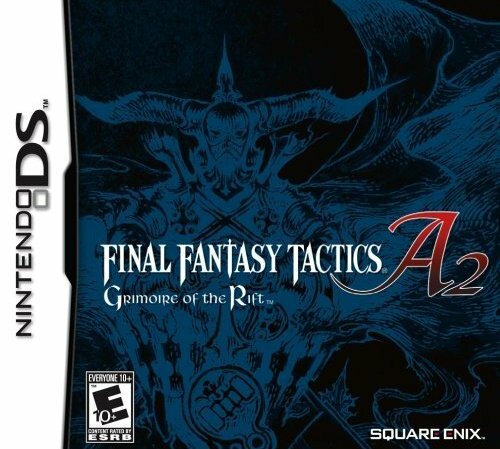 It is Final Fantasy Tactics A2: Grimoire of the Rift. Many changes took place between this Nintendo DS installment and the Game Boy Advance's Final Fantasy Tactics Advance. For one, there are over 300 unique missions in the game. Some are story-related while others net the player's party with unique rewards. This means that if players want to see everything FFT A2 has to offer, they will have to devote a serious amount of hours to do so. Some enemies have gotten especially large and now take up more than one square on a battlefield. The amount of jobs and abilities has been expanded as well, allowing party members to equip weapons and armor pertaining to their jobs. Through gaining Ability Points, or AP, new abilities are learned. Like Tactics Advance before it, Grimoire of the Rift makes for a whimsical journey, a completely stark contrast to the war-torn version of Ivalice of the original Final Fantasy Tactics. What wraps up this fun-filled tactical RPG is the charming presentation, from the bright and detailed visuals (backgrounds, sprites, special effects, etc.) to the marvelous music. Final Fantasy Tactics A2: Grimoire of the Rift is quite the capable game for fans of the series and games where you need to plan your actions out thoroughly to enjoy.